Prince Semien Fielder was born on the 9th May 1984, in Ontario, California USA. He is a professional baseball player, who plays in the position of the first baseman, and designated hitter. Currently he represents the Texas Rangers in Major League Baseball. Prince is signed to the Boras Corp agency and his agent is Scott Boras. Fielder has a number of career highlights and awards including six All Star titles, three Silver Slugger Awards, NL Hank Aaron Award, MLB RBI co-leader Award, and many others. Prince Fielder has been playing baseball professionally since 2005. 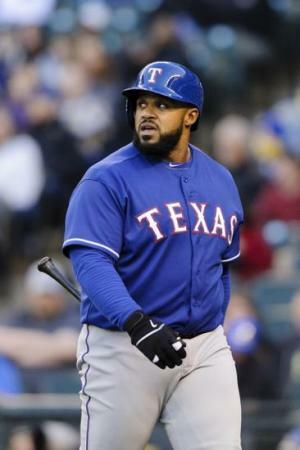 How much is the net worth of Prince Fielder? It has been estimated that the overall wealth of the professional baseball player is as much as $60 million, as of the data given in mid-2016. Reportedly, his annual salary reaches $24.3 million, not to count the money he gets from various endorsement deals with Rawlings, Nike and other companies. To begin with, he was named after the well-known celebrity singer and musician Prince, and is the son of the former professional baseball player Cecil Fielder (professional career 1985 – 1998), who was his first trainer, whereas his mother Stacey was the fitness model, trainer and beauty pageant contestant Mrs. Michigan. Prince played junior baseball at Saint Edward’s School, followed by playing at Florida Air Academy and Eau Gallie High School. In 2002, he was named the All-Space Coast Player of the Year by Florida Today. From 2002 to 2005, Prince successfully played in minor league baseball. He received a call up to the Major League in 2005, and debuted representing the Milwaukee Brewers, and played in the aforementioned team up to 2011. Fielder experienced his breakthrough in 2007 – that year he was the NL home run leader, won the NL Hank Aaron Award, as well as becoming an All Star for the first time. As a result, the net worth of Prince Fielder increased considerably that year. From 2012 to 2013, he played with the Detroit Tigers, but with only moderate success. Since 2014, Prince is been representing the Texas Rangers. In 2015, Prince Fielder won the AL Comeback Player of the Year Award. According to the MLB statistics presented on 29th May, 2016, Prince owns the batting average of .284, slugging percentage of .509 as well as 1,612 hits, 314 home runs and 1,010 runs batted in. It is worth to mention the fact that in April, 2016 Fielder set the new record, as he made his 1,000th RBI, thus he and his father became the first father and son to reach that mark – Like father, like son. Finally, in the personal life of the professional baseball player, he married Chanel in 2005, and the family has two children named Haven and Jadyn. In 2013, Prince filed for divorce, but a year later the two had reconciled. For some tome Fielder was a vegetarian but gave it up. Prince and his family are based in Orlando, Florida. 1 Most Valuable Player of 2011 MLB All-Star Game (2011). 2 He and his father Cecil Fielder are the only father-son pair in baseball history to hit 50 or more homers in a single season. Cecil hit 51 for the Detroit Tigers in 1990. Prince hit 50 for the Milwaukee Brewers in 2007. 3 Son of former major leaguer Cecil Fielder. 4 Winner of the Hank Aaron award in 2007.